Take your video blogging to the next level with the D5 Video Blogging Kit. 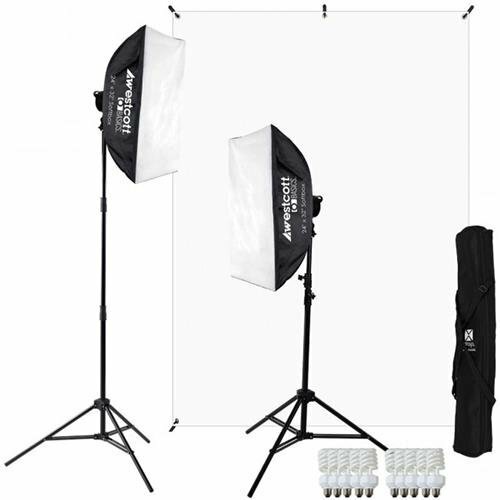 This kit includes everything vloggers need to create professional-quality lighting. Suitable for all types of video and photography use. The continuous D5 lights produce a beautiful daylight-balanced light source and are shipped with 10 flicker-free fluorescent bulbs. With nearly 3000 Watts of output, this kit creates the bright, high-quality illumination needed for video, even when using a webcam. 5 switches on the back of the D5 light head allow for exact output control and the D5's built-in tilter bracket allows for exact positioning on the included light stands. Included rectangular D5 softboxes allow users to control the direction of light output and soften their light source. This Video Blogging Kit also includes the easy-to-use x-Drop Backdrop and Frame. The x-Drop Frame features telescoping arms and a lightweight design, allowing for compact storage and setup in confined spaces. The 5' x 7' White x-Drop Backdrop features a thick, wrinkle-resistant fabric that can be machine washed. This high-quality material allows for simple lighting and a high-key appearance in front of the camera.